In dynamic business world, mastering prioritisation is one of the key success factors. I think prioritisation is a good mix of art and science. To prioritise, first it is important to separate assumptions from facts, silence from noise, and problems from solutions – Art. At the same time, there is need for some methods. Methods that helps to process complex information to see things in muddy water- Science. 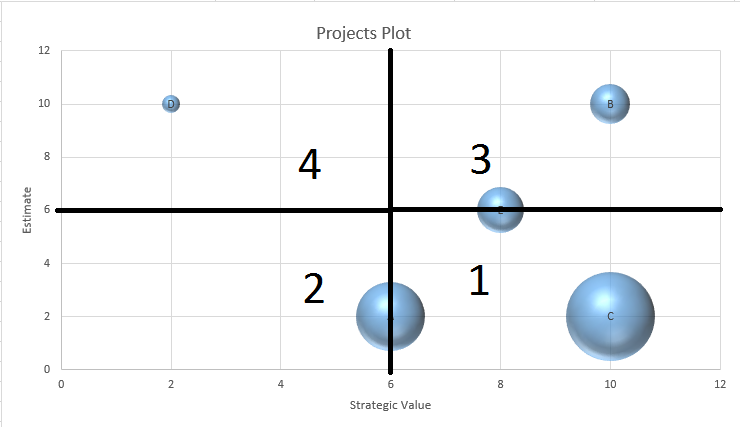 In this post, I am sharing with you some awesome tools, tips and method to prioritise programs in any change portfolio. Before we go into further detail, let us first clarify on some key concepts. Portfolio: By portfolio, I mean an organisation/team within enterprise that takes ownership of all change initiatives. This team (Portfolio Management) assures that change initiatives supports enterprise strategic vision and goals. Program (Programme): Program is temporary initiative with the objective to meet certain outcomes. Each program helps to achieve one or more strategic objectives. Further, one or more projects may deliver any given program. So, now we know more about portfolio, programs and projects. How can we prioritise programs to maximise portfolio value? Politics aside, Portfolio Manager/Board must have good understanding of each program. Business Analysts (BA) should be able to help here. They can collect relevant information. Package information in the way it is easy for senior stakeholders to understand. This is not a detailed documentation of requirements or solution. Instead, it gives enough information to portfolio stakeholders to help them make informed decisions to prioritise effectively. BAs should prepare documentation with broader perspective. They should consult stakeholders from diverse domains (HR, Finance, Operations, Legal, Regulatory, Corporate, Sales, Credit and PMO etc.). If program documentation end-up in couple of pages. Then, add relevant information on A4 page as shown. It will help Portfolio stakeholders succinctly understand each program. Next steps are to prepare ball ballpark estimates, determine strategic value and deadlocks (showstoppers) for each program. Collate information in the way it is easy for board to follow and prioritise. Circulate information to all board members. In prioritisation meeting, board members have wealth of knowledge to take informed decisions. Board members may discuss about programs is quadrant 1, followed by 2 and 3. Board members evaluate risks and find ways to break deadlocks against important programs. This will help them to formulate Change roadmaps that supports strategic vision and goals of enterprise. What are your thoughts on this topic? What tool, techniques and methods you have used in past? 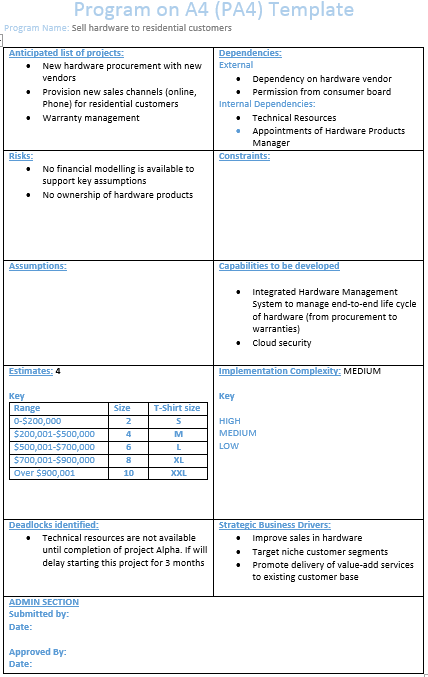 ← Software Vendor Selection – How Not To Fight With Your Software Vendor! Your proposed methodology is similar, except that you approached it first from a portfolio perspective, whereas I proposed to approach it from business problem perspective, followed by the capability perspective. When capabilities are well established, the portfolio lens is suitable.